The dazzling Irish painter created portraits with an amazing force of precision. 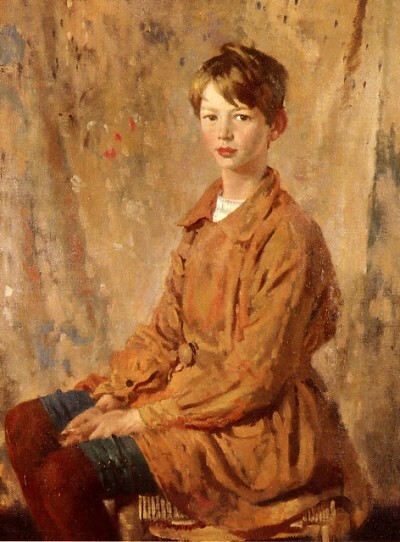 This very appealing portrait of a young boy is based on a conventional "artist's studio pose"the lad takes his position before a standard neutral studio drape, looks "three-quarter left," and maintains an erect pose. But there is nothing conventional or ordinary in the execution. The background sparkles with rich, variegated color. The four pieces of the boy's costume register individual color notes that resound like major chords: the ochre smock has lush passages of orange and yellow, the blue leggings and the maroon stockings each strike a musical note, and the white at the boy's throat draws the eye upward. Don't fail to notice Orpen's masterful use of reflected lightit shimmers in the shadows side of the face and glows in the shadows of the smock. "The untimely death of Sir William Orpen has been a blow to modern British art. We have lost a painter who, while he had already achieved fame, would have carried the laurels of the British school of to-day to a still higher level had he lived. His work shows an amazing force of precision in the realization of individual character. He never failed to tell you all about his sitterall that could be told in paint by the cleverest hand and the keenest eye. The face of the man before him was like the page of an open book which he read with astonishing insight He made a literal transcript which he handed on to anyone who cared to know. "Even with his Irish sense of humour Orpen always told the truth. This is real portraiture." Every working portrait artist would do well to study Orpen. William Orpen, the son of a Dublin solicitor was born in Stillorgan, County Dublin in 1878. He studied at the Metropolitan School of Art in Dublin and the Slade School in London, where his fellow students included Augustus John. Orpen soon became known for his portraits of public figures and during his career produced over six hundred of these pictures. In 1916 Orpen's friend, the Quartermaster General, Sir John Cowans, arranged for him to receive a commission in the Army Service Corps. This mainly involved him painting the portraits of senior political and military figures such as Winston Churchill and Lord Derby. In 1919 Orpen was commissioned to paint portraits of the politicians at the Versailles Peace Conference. After the war Orpen returned to portrait painting, including one of Prime Minister David Lloyd George (1926). Sir William Orpen died in 1931.
ing the world's most interesting personalities. Site created by A Stroke of Genius, Inc.